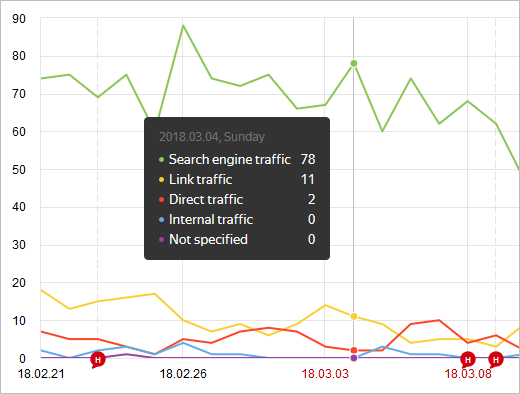 Notes are displayed in Yandex.Metrica reports and in Graph widgets in the Summary section. The note title – hover over the icon. The note text – click the icon for the note. You can create and edit notes while viewing reports. Widgets show the note icon and title. To see the title, hover over the icon. You can only view previously created notes here. 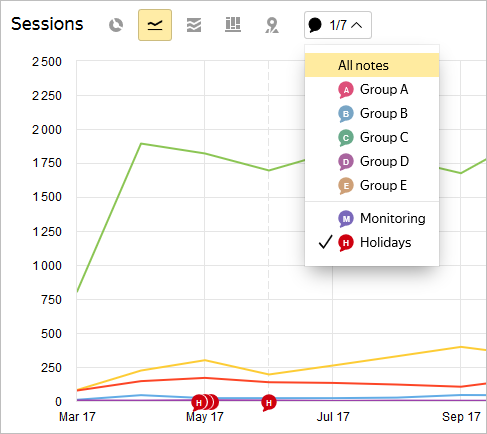 If you are viewing widgets or reports for an extended time period with details by the month or week, the notes are grouped on the chart. When you click a group, a window opens with all the notes. To show notes from one or more groups on the chart, click and select the group from the list. To hide notes, deselect them in the list. Attention. You can create and edit notes only in reports. You can create notes for any date. You can also group notes together. There are multiple groups available to choose from: A, B, C, D, E. You can't change the names of the groups. In the report, put the cursor on a graph segment where you want to add a note, and click a point on the graph. In the window that opens, check the date, fill in the fields, and choose a group to assign the note to. You can enter a time for the event that you are adding a note about. If you don't enter a time, it will be set to 00:00. 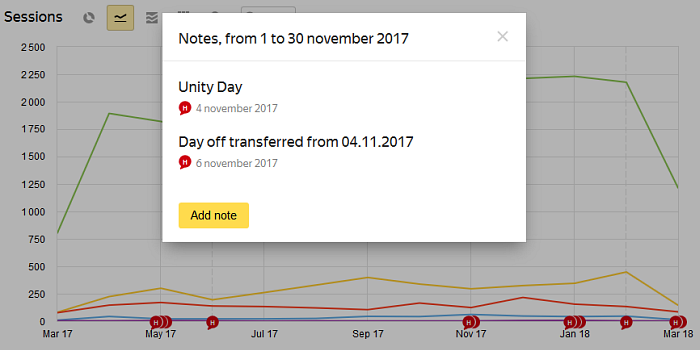 The icon for the note you created is shown on the graph near the date that you specified. Click the icon for the desired note. In the window that appears, hover your cursor over the title and click . Click the icon for the note that you want to remove. In the window with the description of the note, click .